Unable to continue work for health reasons, a carpenter struggles to negotiate the welfare system. I, Daniel Blake was viewed at the 2016 Cannes Film Festival. 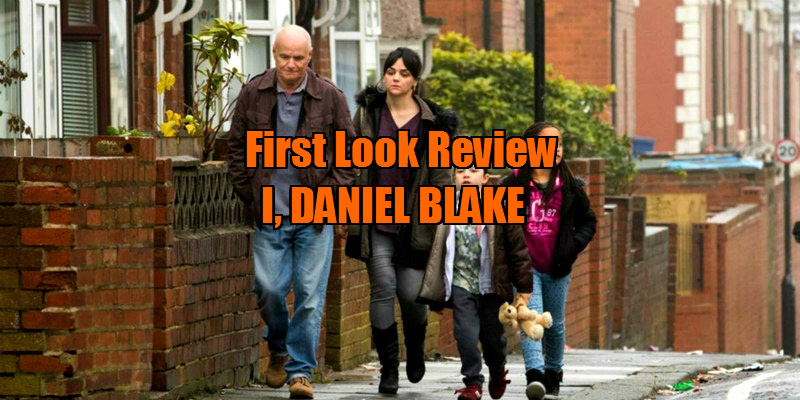 I, Daniel Blake accomplishes what it sets out to do, which is show in detail how merciless the cycle of poverty can be. What’s more, the film’s message and critique are hugely relevant; the film functions as a carefully thought-out exposé of the inefficiency of bureaucracy without going about it in an unthinkingly Randian fashion. The Palme d’Or at this year’s Cannes Film Festival was not awarded to the epic American Honey, the layered Toni Erdmann or the poetic Paterson, but rather to veteran director Ken Loach’s I, Daniel Blake, a straightforward social issue picture. With I, Daniel Blake, Loach, now 80, continues to affirm himself as a cinematic champion of the lower class. Yet even if Loach’s film powerfully delivers an important economic message, it is dogged by basic storytelling contrivances. Ultimately, however, story and character may not be the most important aspects of this mostly-effective award-winning film. I, Daniel Blake begins with a phone call that we can all identify with on some level - the titular widower (Dave Johns) tries, in vain, to explain to a bureaucratic governmental agency that, due to a recently developed heart condition, he is unable to work in his carpentry workshop and requires social benefits until his doctor clears him to work again. Later, when he is required to meet with a government social worker in person, Daniel meets Kitty (Hayley Squires) at a social security office. Kitty, a single mother of two from London with serious financial problems, forms a deep, nearly familial bond with Daniel, and together the two support each other as they negotiate the financial and emotional difficulties that life has flung them into. I, Daniel Blake feels most successful when Daniel deals with real-world financial and social situations. When Daniel sets out on foot to look for work in his grey city or when he struggles to understand 21st century technology at an internet café, the humble nature of his difficult quests resemble those found in the Dardennes’ Rosetta (1999) or Two Days, One Night (2014). The suppliant, calm-but-urgent nature of Daniel’s struggles moves us while simultaneously informing us in a specific way on the real tribulations that the elderly and impoverished face. The frustration Daniel - and consequently the audience - experiences is often alleviated by the character’s endearing humour. When exasperated by his circumstances, Daniel does not sink into despair or even crotchetiness; his difficulties only sharpen his sardonic, incredulous sense of humour. What’s more, this humour is only the tip of the iceberg of Daniel’s will to live and to live with dignity. The real engrossing drama of the film involves his angry yet thoroughly rationalised rebellion against the unjust (or perhaps more accurately, tragically unorganised) system; as Camus said, rebellion is an essential part of the human experience, so to see our elderly hero, so finely and heartbreakingly brought to life by actor Dave Johns, revolt in his own small but persistent way makes I, Daniel Blake a satisfying movie. Nevertheless, the emotional power of the frustration and struggle in the film isn’t as raw or direct as it should be. Two years ago, Loach made Jimmy’s Hall, a perfectly fine little movie that unfortunately indulged in much cinematic banality. It’s even more unfortunate that I, Daniel Blake indulges in the same sort of banality; it significantly dampens the film’s all-too pressing message. Take for instance the scene in which Daniel and Kitty first meet - as he sees the young single mother confront a particularly acrimonious social security agent, he rushes to bolster her arguments, and the two become fast friends. Even if the friendship between Daniel and Kitty does eventually gather some veracity, Loach’s clumsy staging of their first encounter (both visually and within the narrative) feels like a significant contrivance. A similar criticism could be levied against the relationship Daniel enjoys with his young neighbour. This neighbour, an enterprising adolescent who ships potentially counterfeited shoes in from China to sell at a lower price, helps Daniel with his technical difficulties while dealing with the governmental agency. This is believable. Daniel hangs out with the boy and his friends as they Skype with the boy’s Chinese business contact. This is not believable. Other moments that simply ring false include Daniel’s overwrought monologue on his deceased wife and the nearly cartoonish villainy of one of the workers of the government assistance program. These baseless relationships and broad characterisations feel manipulative rather than organic - it’s almost as if I, Daniel Blake doesn’t trust the inherent power of its simple story and uses twee tropes as a result. But to a certain extent, these flaws affect I, Daniel Blake as a cohesive and realist artistic vision and not as a filmic conductor of an economic message, and Loach’s film is more the latter than the former. In this regard, I, Daniel Blake accomplishes what it sets out to do, which is show in detail how merciless the cycle of poverty can be. What’s more, the film’s message and critique are hugely relevant; the film functions as a carefully thought-out exposé of the inefficiency of bureaucracy without going about it in an unthinkingly Randian fashion - and I can’t think of too many films that have made such critiques as soberly and as realistically as I, Daniel Blake does. 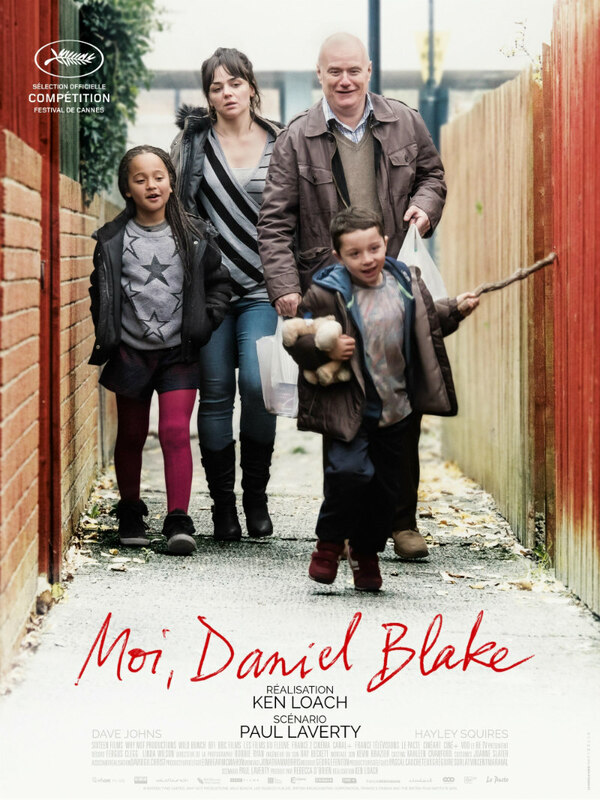 Now, in an age when growing wealth gaps can be observed and felt around the world, I would not be surprised if other filmmakers, both established and novice, followed I, Daniel Blake’s lead - and that would obviously be a good thing for awareness on such issues. But should more films like this start being made, the debate should ask questions like whether a film on the debilitating effects of poverty can succeed while maintaining a highly aestheticised style (also at Cannes were Andrea Arnold’s American Honey and Brilliante Mendoza’s Ma’ Rosa, both of which I consider more successful in this regard). Still, though often undeniably contrived, I, Daniel Blake is a studied reminder of the responsibility we have towards one another, and that will never not be important.